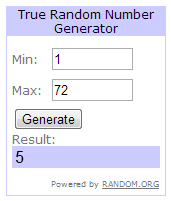 It's time to announce the winner of my giveaway. I'm happy that my followers now are over 300 - I do hope that it's because I have something interesting to offer here in crafty blogland and not only because of the giveaway. I used random.org to pick the lucky one and the number is #5. Amanda Jones!!! Congratulations my dear follower. I will contact you as soon as possible to get your shipping address, so that I can send you your crafty items! Hope that they will be of good use to you.